In this category we present various types of YPC valves actuated by hand lever. They differ in shape, function, and they way the lever works. You can easily find the one that works best for you. YPC guarantees high quality and robust design. Valves conform to the required standards. Flow (5 bar) from 900 l/min to 4500 l/min depending on valve size. Working temperature from 5 to 60°C. Lever parts: Steel, POM, Aluminium, NBR (depeding on model). 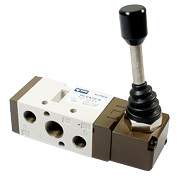 Lever Operated Valve 3/2 - 1/8"
Lever Operated Valve 3/2 - 1/4"
Lever Operated Valve 5/2 - 1/8"
Lever Operated Valve 5/2 - 1/4"